Quickly and easily determine a remote GPS location from two, or more, geolocated points with compass bearings to that location. Fully automated use of iOS device location. Compass bearings are best manually entered. Manual entry/edit of any/all readings. On map display in various display modes. Share the triangulation to others. Automatic location to address lookup. 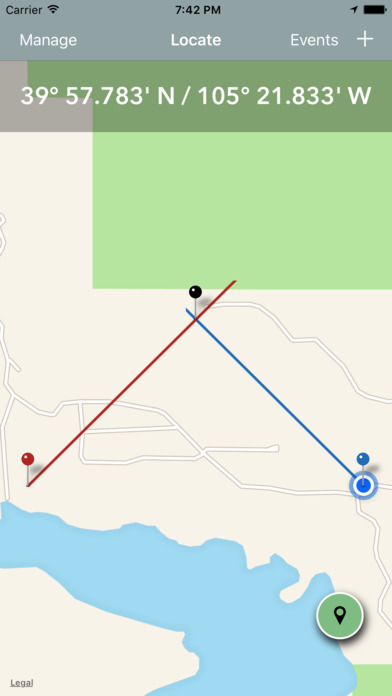 Use your iOS device & compass to take bearing on a remote location from two locations and Field Triangulate will calculate and display the GPS coordinate for the remote location. Enter readings provided from a remote person (perhaps by iPhone or radio) and add your own readings manually in order to calculate a remote location. Radio telemetry involves triangulation to track the movements of individuals of a species via radio signals produced via tracking collars or devices. Be it wolves, mountain lions or wildfowl use Field Triangulation to calculate the location of the target animal. In wildland firefighting triangulation is used to locate a remote smoke plume. This can save time and a lot of effort, especially when the fire is in remote mountains or woods.